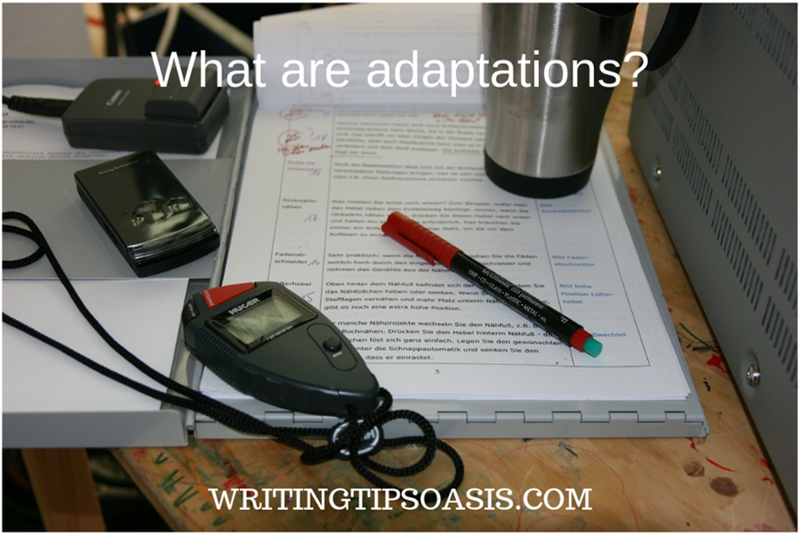 Part I: What are adaptations? 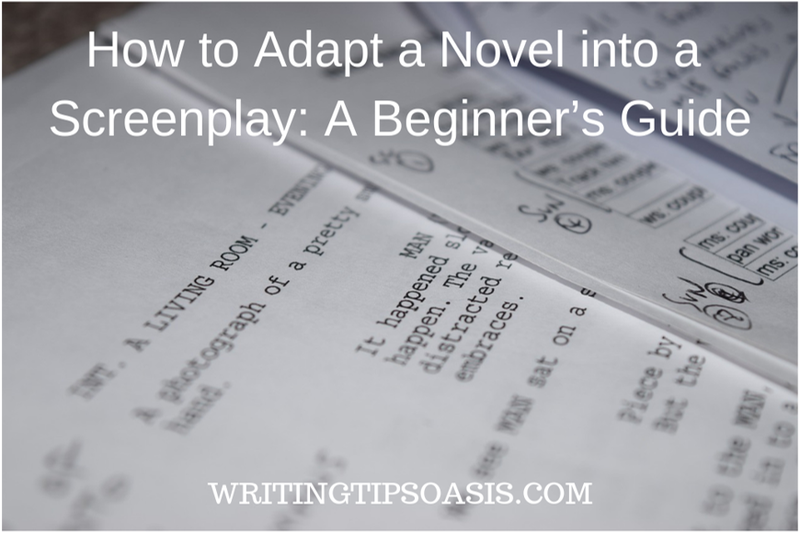 Welcome to Writing Tips Oasis and to our newest guide: How to Adapt a Novel into a Screenplay. Previously, we covered guides focusing on genre fiction, from romance to dystopia, as well as nonfiction, including memoirs. Now, we’ve decided to tackle adapting a novel into a screenplay because writing a script differs from writing a novel, and enables the writer to explore the art of storytelling in a more visual manner and experiment. Here you will discover why the book is (most often) considered better than the film, and why screenwriters have to cut a lot of book material to make it fit into a 90-page screenplay. 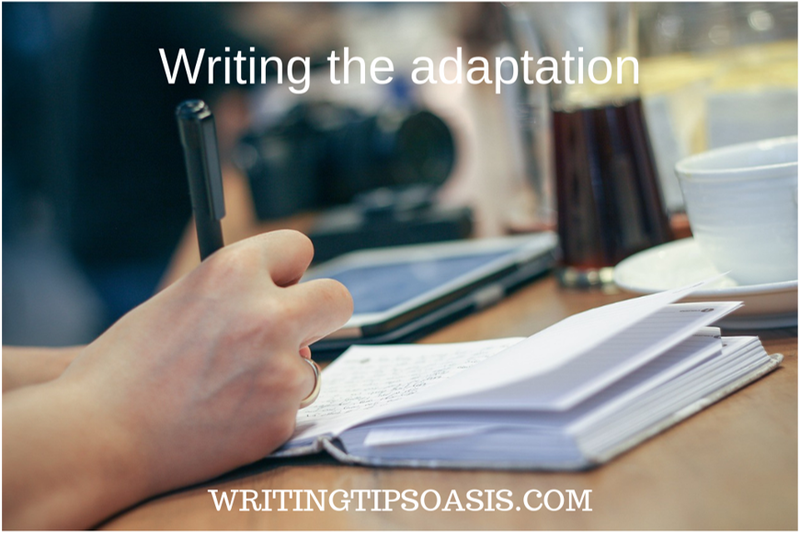 Adaptations, in essence, retell the story portrayed in a short story, novella, or a novel. Like most films, the average length of an adaptation screenplay can range between 80 and 120 pages. Why? Because one page of a screenplay equals one minute of a film, on average. This means that your lovely novel of 400+ pages will never be 100% portrayed on the screen (that is, if you’re one of the lucky writers out there whose work actually does get portrayed on screen – but alas, that is a different guide altogether). For the purposes of this guide, we will cover the basic ways and methods of adapting a novel, short story, or a novella. This means that you will not be inventing a new story, but retelling an existing one. However, this guide will also help you view your own novel in a different light. As such, writing a screenplay can be an experience that will aid you in becoming a better writer, a better novelist, paint more vivid images in your novels, regardless of whether you choose a career as a screenwriter or a writer. A full length novel is, on average, 80K words or more. Epic fantasies sometimes go above the 100k mark, which is why they’re considered epic in the first place. Adapting a novel of such length means having a longer screenplay – however, the length of the screenplay depends more on the producer rather than the screenwriter. On the other hand, even if you’re writing a screenplay adaptation of a novel and have no limits on the length of the screenplay, you should still keep within the average guidelines, especially if you want to pitch your adaptation to prospective directors and producers afterwards. Word of advice: try to adapt a novel that was written by someone else. If you’re trying to adapt your own work, you may care about each scene, each paragraph so much that you’re unable to condense the story to fit in the required page length. On the other hand, when you’re adapting someone else’s work, be careful not to interpret and represent the given material in such a different way that it barely resembles the original work. This has happened before, and has left a lot of book fans enraged when the film finally comes out and it barely resembles the original novel. In an ideal world, adaptations would match the original work (novel, novella, short story), one hundred percent. Nothing would be missing, and fans of the book would love the adaptation. However, there is only so much you can do in 90 pages. For this reason, writing an original screenplay is a task that’s actually easier: because you follow a different structure for films than you do for novels. Writing a screenplay adaptation of a novel is more difficult because you need to adapt the story to the structure of film. On the other hand, film is an audio-visual medium, and as such, it offers more means of storytelling, not just in the visual sense, but in sound as well. It’s the amalgamation of both that creates the emotions in the viewer, not simply just what is portrayed on screen, the dialogue, or the characters. With an original screenplay, you’re directing your mind to be creative in a different way, compared to a novel. In a novel, you rethink every sentence, every word almost. In a screenplay, you discard the flowery, literary language, the metaphors and the similes. In a screenplay, you write in what is to be shown on the screen, and in what order. If you use metaphor, it has to be within the language of film (of which we speak later on in this guide), and sentences like, “She swayed, like a candle in the wind,” do not belong in a screenplay. An adaptation portrays the highlights of a novel, and in the meantime, uses language of film to add depth to the story through symbolism. When you’re writing a novel, you need to pay attention, at the very least, to the number of words. When it comes to screenplays, you have to pay attention to the number of pages, because one page translates to one minute on the screen. Yes, you can write a screenplay that has more than three hundred pages, but that translates to three hundred minutes – and chances are, that screenplay will never see the light of day. In a novel, there is also a lot of emphasis on narrative, point of view, and writing style. Depending on the story, you may write your novel in first, second (even though this is quite rare), and third person point of view, limited or omnipresent. Screenplays are always written in third person point of view. Even if the original work was written in first person, you need to find a way to adapt this for the screenplay in a way that shows everything on the screen. In a first person point of view novel, for example, two side characters may do something important related to the plot that we only learn about later through dialogue. In a screenplay, you can show the scene directly, and then have the protagonist learn about it – and even avoid the dialogue entirely, since the viewers will already deduce what the protagonist is being told. Before embarking on the task of writing a screenplay, there are three things you need to do. First, you need to read as many screenplays as you can. The good thing about screenplays is that a lot of them are available to read and download online, and some websites even have collections of screenplays of Oscar-winning films, popular TV shows and more. These will help you understand the difference between screenplay terms, like EXT, INT, how characters are presented for the first time, usually with their names in capital letters, approximate age, and markers of appearance. In addition, you will understand what’s important to represent in a screenplay, and what is not. Second, you need to read at least the basic formatting rules in screenwriting. The size of the margins, the font and size, 12 pt Courier, the beginning of the screenplay (FADE IN), the position of dialogue, different ways of transitioning between a scene, and a lot more. In addition, read a screenwriting book that focuses on everything: from the rules to the structure of a screenplay, and how the inciting incident for the plot must happen within the first fifteen pages (fifteen minutes) of the screenplay (film). Third, and most important – get a screenwriting software. If Microsoft Word and Scrivener are a novelist’s best friends, then Final Draft (and other similar programs) are a screenwriter’s best friend, for the sole reason that the software does the formatting for you. You can write in a MS word template for screenplays, yes, however, the template is very basic and difficult to translate to each page, while Final Draft (widely considered the best screenwriting software out there) does the job for you. The downside is that Final Draft is not free. If you cannot afford it, you can try other programs for free, like Celtx, or even better, Drama Queen (which has both a free and premium version, and for the basic screenplay, the free version works quite nicely). If you were writing an original screenplay, this document would be called a treatment. The treatment basically encompasses every scene and tells what happens in each scene. It should not be longer than five pages, although even one page would often suffice. Many screenwriters disagree on when they write a treatment. The purpose of the treatment is to show it (or pitch it), to directors and producers to entice them to make your film (although, pitching a film is an art in and of itself that needs more than just a good treatment), so a lot of screenwriters prefer to write the treatment after they’ve written the screenplay. However, there are benefits to writing the treatment before writing the screenplay, especially if you like to outline a novel and plot it before writing it. A treatment helps you write the screenplay in the same way that an outline would ideally help you write a novel – it’s your story guide, in a way, preventing you from getting lost and following story tangents that might not be important or plot and character related. And when it comes to adaptations, it helps you in realizing problems before you get to them while writing the screenplay. First, you can write an outline that follows all of the scenes in your novel, one by one (and this treatment will probably be longer than 5 pages). Then you can analyze it and discover which scenes you need to change in order to tell an 80K word story in about 90 pages in a visual manner. The first thing you need to remember when writing an adaptation is that you are not writing literature. A screenplay is a guide for filmmakers on what each scene of the film needs to show. And while a lot of writers and authors discard the literary value of genre novels, for example, from this perspective, they are also literature. So, no matter what genre your story belongs in (literary or otherwise), when it comes to adapting it for the screen, you need to remember that the same descriptions and even dialogue that worked in the novel will not work for the screen. You simply cannot copy paste the descriptions and dialogue in screenplay format and call it day. And that’s just the beginning of it. As a result, abandon whatever flowery language you may use when writing a novel, abandon the use of similes and comparisons, and the introduction of characters becomes even more difficult, because it’s one thing to write “Mary met her friend Harry at the grocery store that gloomy Monday,” in a novel, and a completely different thing to write the same sentence in a screenplay. You need to show that Harry is a friend of Marry in a visual way, and just writing that in screenplay will not do. This means that you need to redefine your means of storytelling. If it’s better to show instead of tell in a novel, when you’re writing a screenplay, everything is essentially tell when you’re writing the screenplay, and the show actually comes from seeing it on the big screen afterwards. With your treatment and the novel (or other literary work you mean to adapt) at hand, you can essentially begin the journey of writing the screenplay. 1) Does this scene move the plot (or subplot) forward? 2) Does this scene show something important about the protagonist (and other characters)? In the ideal novel, every scene will answer yes to these questions, which would make writing the screenplay easier – or more difficult, especially if the novel is a massive piece of work like Lord of the Rings, for example (the three film adaptations of the three novels in the series are about eleven hours long). However, just because you cannot portray all of the scenes from the novel in the adaptation, it does not mean that you cannot use the film medium to the fullest to portray the same story. This is why adaptations have the “based on” or “inspired by” at the beginning – because it’s the same story told in a different medium. It is impossible to talk about any phase of making a film (from writing a screenplay, to filming and editing), without talking at least a little about the grammar of film language. Film is primarily a communication medium, and like any other means of communication, it has its own language and grammar. The better you’re versed in it, the better a filmmaker you will be, even if all you want to do is adapt your novel into a screenplay. Of course, the basics of it are easy: a frame is a letter, a shot is a word, a series of shots creating a scene are analogous to a sentence, a sequence of scenes focusing on a single theme or motif is analogous to a paragraph. But that’s just the start of it. It’s not just about having all of these in your screenplay, it’s about what is shown in them. Now, a screenplay is not the place where the screenwriter decides on the types of shots and camera movement – that’s something that is ultimately decided by the director. However, you can use symbolism in your adaptation to enrich the story you’re telling, by putting an emphasis on things that are important to the story, but cannot be relayed in dialogue or action. Your characters are not standing in front of a white wall, unless it’s important. If we see several photographs behind the characters, what do they signify? In addition, how do you dress your characters? Are they dressed in similar colors (signifying friendship), or are they dressed in black and white and are at odds with one another? Here, you get help from the novel itself. A well-written novel will have the symbolism down perfectly, and you can use this to show, not tell, a better story for the screen. On the other hand, if we focus solely on the grammar of film language, this guide would be too long and we wouldn’t even get to the rest of the important things you need to know about adapting a story. However, any screenwriter should get their hands on books that focus solely on this topic, in order to understand not only screenwriting, but filmmaking in general. In a novel, you have a lot more time to develop the plot, the subplots, and the protagonist and the other characters. In a screenplay, you have a lot less time to do this. Meaning, you need to adapt a 400-page plot in about 90 pages. This means that you need to eliminate a lot of subplots and find ways to incorporate them in the main plot, or, in other words, simplify the plot for the purposes of showing it on-screen. The good news is that all plots boil down to the same thing: protagonist discovers a problem, which is the inciting incident and has to happen within the first fifteen pages of the screenplay. Next, the protagonist tries to fix the problem in the easiest possible way (because that’s what humans do most often), and that marks the first plot point. The solution seems to work, at the beginning, then things start going bad for the protagonist and reach a culmination. At this point, the protagonist has learned something, and comes to the right solution for the problem, which is the second plot point. The rest is the resolution: how the right solution pans out for the protagonist, and we come to the end of the film. It all sounds very easy, in theory. In practice, it’s a bit more difficult, especially if you have to cut away a lot of subplots, a lot of side characters, and instead of having the protagonist in about a hundred scenes, now you maybe have to do this in fewer than fifty scenes. However, once you write out the crucial parts of the plot, you can use the rule of cause and effect to guide the story, and with the focus on both character and plot, you can (and have to, actually), make each scene poignant and important. In a film, you have the main character – the protagonist, secondary reoccurring characters that would appear in more than one scene, and the characters that appear only in one scene and are forgotten afterwards. This means that you need to analyze your novel and decide which of the secondary characters will you keep in your screenplay in their original form. Less is more in film, and you may have to combine several characters into one, or just omit characters that are not that important. Once you’ve decided that, you can proceed on writing the scenes of your adaptation with those characters’ arcs in mind. Remember, the plot moves horizontally and depends on cause and effect. The characters are a vertical line that moves across the horizontal one: meaning, everything you show about the characters in the first scene that they appear in needs to be either consistent – or show a sense of progression. If your protagonist is afraid of dogs in the first scene, then by the end of the film, if she appears in a scene with another dog and does not react to it, then you have an inconsistency of character. If she frightfully pets the dog in the later scene, this shows a sense of progression to her character (and would be very important if the plot is focused on the character’s fear and frightful nature and the story is about her overcoming her fears). On the other hand, stray away from inventing scenes that were not present in the novel just because this new type of scene you have in mind is more awesome and more fun to write, because it is usually these scenes where characters (who, since this is an adaptation, are already well known by readers and fans), act out of character. This might kill the suspension of disbelief in the viewers, and as a result, you create an adaptation that angers fans rather than pleasing them, an adaptation that is not a true retelling of the original. Foreshadowing and foretelling are very similar, because in both cases, you’re announcing to the audience what is about to happen. The difference between them is that foreshadowing is a hidden announcement, expressed through symbolism and ambiguity, while foretelling is a loud announcement that the reader (or, in our case, the viewer) cannot miss. To create tension, evoke an emotional response in the viewers at the moment of the payoff, and tell a more a cohesive story. Here is an easy example of foretelling: voiceover at the beginning of the screenplay that says, “had I known what I would see at the club that night, I would have stayed home.” Another easy one can be found in almost all horror films: at the beginning of the film, we see the hero, or heroine, jumped from behind by a good friend. They have a good laugh. It does not take a genius to realize that later in the film, we will see another jump scare in a similar manner. On the other hand, foreshadowing is hidden and symbolic, it’s there to draw the attention just enough to place a seed in the viewers’ minds, and when it pays off later in the film (or the screenplay), the viewers have an emotional reaction. For example, we may meet the heroine in the kitchen at the start of what is to be a very long journey that may involve visiting several different states or cities. In the background, we may see her fridge, and on that fridge, we may see several magnets that depict the cities she is about to visit on her journey. This actually does us a double favor, because first, the fridge shows that the protagonist is a bit of an adventurist (or makes us think that), and second, it foreshadows the places she is about to visit. Make this even more poignant by having her say, at some point, that the magnets were gifts by her wayward brother, and now that he had disappeared, the magnets are basically all of the clues she has as to where she can go look for him. The above example does not mean that foreshadowing happens only in the background. On the contrary, you can also have foreshadowing in dialogue – although, you hide it in ambiguity, because you may go into foretelling territory. An offhand remark that pays off later in the screenplay is only good if the reader/viewer will not see it as anything but an offhand remark. Maybe two friends are in a clothing store. One of them lifts up a red dress and wiggles it at the protagonist. The protagonist may say something along the lines of, “Trouble. Try a blue one.” Later on, after the viewers have forgotten about the offhanded remark, the protagonist is put in a situation where they have no choice but to wear a red dress (or just a red garment) at a moment when he/she gets into trouble. In other words, foreshadowing depends on hindsight – it has to make the viewers feel like they should have seen the payoff coming. Foretelling, on the other hand, is supposed to increase tension not around what happens – since that has been announced already – but at how it happens. To go back to the foretelling example from above, we understand that the character saw something at the club, and now we’re waiting patiently to see what it was, and the longer we wait, the more anxious we get about discovering what the character saw at the club. How to avoid overdoing it? By using red herrings. Red herrings are little things and offhand remarks that do not get a payoff. They’re used to mask the real foreshadowing and foretelling elements in order to make them even less obvious. Red herrings either do not get a payoff, or they get a payoff in a different way than we expect. For example, a character may say, “I’d actually prefer a convertible, but I can’t afford one,” when talking about their car, which is not a convertible. Later on, perhaps after a vicious action-parked car chase, the car gets trashed (but still works), and to add insult to injury, the top of the car gets blown off. The audience was expecting the character to afford a new convertible, but the character gets the convertible by having his/her current car damaged. There is a myriad of ways to show and don’t tell in a novel. In a screenplay, your job will be a lot harder because you do not depend on words to paint a picture of how a character feels about something, you need to show it in a visual way. However, there are two ways to achieve this. First is by the use of action, and second is by using grammar of film language and symbolism. What this actually means, though? It means that some of your scenes will need to be shown in a more dramatic way than they were in the novels. In a novel, the goal is to show characterization in a subtler way – by a gesture, a spoken word, a tone of voice, a tremble. You want the reader to figure out the exact nature of the emotion, because readers are smart do not need to be told that a character is afraid, or happy, or sad. In a screenplay, these will become a sharp wave of a hand, a sharp tone or a quiet one, and trembling will become shaking, because it’s more visible on screen compared to trembling. These are easy to convey in dialogue scenes as parenthesis – but even so, make sure to not overuse them. Place them where they’re absolutely needed. Not every spoken word needs a parenthesis underneath, unless it’s absolutely important for the character. In addition, be careful of overly descriptive dialogue. On one hand, if the original work is well-written, there is not a lot you need to do to adapt it for the screen. On the other hand, this may be a good moment to reevaluate it. For example, you may have one character sharing a lot of information with other characters. In the original novel, you may have simply had blocks and blocks of paragraphs as the character spoke. In a screenplay, you have to show this moment as something more than just one character talking to another. And a good way to do that is to add action, especially action that flows from characterization and depicts the relationship between the character. The first draft of a novel often has to undergo a lot of edits before it should be submitted for revision by an agent or an editor. The same happens with the first draft of a screenplay – whether it is an adaptation or not. In fact, most screenplays see a lot of changes before they are filmed, and even then, the final version of the film might not perfectly match the screenplay. So, when you’ve finished the first draft of your adaptation, you need to analyze it, scrutinize each scene and decide what to keep as it is and what to change. In addition, since screenplays are not considered literature, ask yourself what is the purpose of writing it. If you’re writing the adaptation with the intention of pitching it to producers or directors in order to entice them to make it into a film, then you need to focus mainly on the story, the plot, the characters, and on the visuals. For example, if your novel belongs in the science fiction or fantasy genre, some of the visuals depicted in the screenplay may be too expensive to create, which may damage your chances of getting it made. If you’re writing an adaptation of your novel because you’ve already sold the rights to your novel and have been lucky enough to write it, you will probably already have a list of changes that you need to make. In both cases, pay attention to the rule of cause and effect, and characterization. Make sure the foreshadowing pays off, the foretelling as well. Remember the rule of Chekov’s Gun as well (if you show a gun in the first act, it needs to go off by the end of the film). First things first: if your screenplay is longer than 120 pages, you need to cut it down until you reach the average length of 80 to 90 pages. Depending on the genre, you can get away with longer screenplays. On the other hand, if you cannot cut away so many pages without major changes to the story – and without damaging the story itself – then consider adapting it as a TV series. A TV series screenplay is different than a screenplay for a film, of course. Depending on the genre and the novel itself, you can create a pilot episode screenplay, and then adapt the rest of the story in an episodic way. This might actually offer you the freedom of depicting the novel better. However, remember that films and TV shows rarely match the original material 100%. Just take a look at Game of Thrones, the adaptation of the series A Song of Ice and Fire by George R. R. Martin – the first season follows the first novel in the series, A Game of Thrones, quite faithfully. However, as the series gained tract, and as the story overtook the existing novels, the showrunners had to make some drastic changes in order to be able to adapt the story on the screen. Had they attempted to depict the story exactly as it is in the novels, they would have needed more than eight seasons, and about a thousand more actors (since the novels currently feature more than a thousand named characters). During the editing process of a screenplay, the most important thing you need to seek is constructive feedback. This does not mean that you can give your adaptation to a casual reader and ask them if the adaptation matches the story, the plot, and the characters. Ideally, you would seek feedback from other screenwriters (and you can easily do this with the help of online platforms). There are many online groups and communities you can join (for example, on Facebook or Reddit), where you can get in touch with other screenwriters and filmmakers and get their feedback. On the other hand, be careful of the type of feedback you’re getting. Ultimately, it is up to you to decide whose feedback you will use to make changes in your screenplay, however, as a rule of thumb, remember that no screenplay is perfect, so beware of those who will claim this for the first draft of your screenplay. It may be a sign that the person you’re consulting has zero actual experience in the matter at hand. In addition, you can hire a story editor or a script consultant who will read your screenplay and give you constructive criticism – for a fee. If you’re planning on pitching your screenplay (or in our case, adaptation of a novel) to producers and directors, it’s highly advisable to get professional feedback, even if you have to invest in it. If your adaptation is too long, there are two things you can do. First, you can cut away whole scenes, and second, you can cut away parts of scenes to make them shorter. The problem, of course, is how to know what to cut and where. The easiest way to discover this is to read each sentence and ask yourself: what is the purpose of this sentence? And, when it comes to scenes, ask yourself, what is the purpose of this scene? The answer should always be in line with plot and character. If the sentence shows something important about the character and the plot, then it deserves to be kept. If the scene is an important step in moving the plot forward, then it is essential and must remain in the screenplay. On the other hand, if the sentence – dialogue, action, a parenthesis, or description – does not imply anything new and important about the plot and the characters, then it needs to go. In fact, the best way to find these scenes and parts of scenes in a screenplay is by liking them. If you like it too much, it’s probably there because you want it there, rather than because it’s necessary. There is a reason why one of the most popular phrases in screenwriting is: kill your darlings. Most often, our darlings are scenes that have no conflict, that do not actually move the plot forward, and are there only because we want them to be there. After you have edited the overall adaptation (or screenplay) in terms of the story, the plot and the characters, you need to go through each of the scenes you’ve kept. Here is where you need to pay the most attention to details and look at the scenes with a very critical eye. You need to ask yourself: is this imagery important (if there is no dialogue), and if there is dialogue, is it crucial to the story? We talked before about action in scenes, and how each action from the book would (ideally) be a little bit exaggerated for the purposes of show more, tell less. The other side of the coin is that you may have too much action in a scene, or an action scene (think car chases, explosions, running, chasing, crying, etc.) that goes on for way too long. It’s not about the action itself, but what the action actually represents. If you have a car chase that goes on for more than five pages, ask yourself whether it’s really important to be that long. And then we have dialogue: if a dialogue scene goes on for way too long, consider shortening it. Ask yourself: is this or that character announcing what they’re about to do and then doing it in the next scene? Because that won’t do. And if that’s how it happens in the book, then so be it, but here you have an opportunity to change it. Dialogue is very tricky to write, especially when you consider the fact that no one talks in real life the way people talk in a film. In the same manner, two friends would never announce their friendship and how long it’s been going on in real life, so, it should never happen on the screen either. What you can take out of this is this: use real life dialogue – but dial it down to the essentials. Yes, it’s normal for a person to say hello when they pick up the phone, but if your scene leads to a phone conversation, why not just jump immediately to the actual phone conversation? Here is an example. We look at a pristine kitchen: dark cupboards, an island, spacious. An empty coffee cup graces the island beside the sink. MARIA, 27, enters the kitchen and beelines for the coffee pot. She sees that it’s empty, and busies herself with making a new pot. As the coffee pot whirs, she goes to the fridge and takes out bread, cucumbers, cheese, ham, and some tomatoes and puts them on the kitchen island. Then she turns around, takes a cup from the cupboard above, and pours some coffee in it. As she is about to drink, her phone rings. Nothing much. Listen, I was reading the newspaper this morning, and as I was going through it, I came across this apartment listing. It’s down by the beach, very nice, a studio with a separate kitchen nook, and I think it will be perfect for you! Hmm, I don’t know Lia. Oh, come on, of course you’re ready! Or maybe you just want me out of your place. Of course not, I just want the best for you. There are several things that are wrong with the example above. First, we do not need to see the kitchen before Maria enters. Second, the conversation between them is so convoluted, it’s painful. No real person talks like that, and dialogue like that is what marks a bad screenplay. (Keep in mind that the example above was written just for the purpose of showing these things. Here is how we would fix it). In a pristine kitchen, we find MARIA, 27, busy making breakfast. A steamy cup of coffee is next to the sink, beside an empty one. MARIA’s phone rings. I found the perfect place for you! They both fall silent for a beat. Let’s just go see it. It couldn’t hurt. In the second example, we left out the unimportant details, like Maria walking into the kitchen, then taking the items out of the fridge, because we’ve already signified that with three words: busy making breakfast. In the dialogue section, we don’t need so many parentheticals – descriptions of actions as the words are spoken, because they can be deduced from the conversation itself. In addition, we do not need to hear just how the character Lia came to the listing, nor do we need to hear so much about Maria’s reluctance. In addition, there is no need for the moment of conflict – maybe you just want me out of your place. Instead, we have an offhand remark that could pay off later in the story, if it turns out that Lia does want Maria out of her hair and apartment. In addition, we also setting this up by having Maria looking comfortable making breakfast at her friend’s place while her friend calls her and presents her with the perfect apartment for her. Both of them have a motivation in the scene: Lia wants her out (even if she won’t admit it), and Maria wants to stay and only reluctantly agrees to go see the apartment. Every author and aspiring writer (or most of them, at least) dream of having their stories depicted on the big screen, and readers everywhere dream of seeing their favorite novels in cinemas. And more often than not, they are not happy with what is depicted on the screen because the film almost never matches the original work completely. However, the truth is, depicting a novel on the big screen is difficult, and it would be very expensive to show each and every scene from the novel in a film. For that reason, the best way to go about writing a screenplay adaption of your novel is with the understanding that you will need to adapt the story, and not show it exactly as it is written in the novel. This will save you a major headache and the inevitable disappointment when you will have to cut away many different scenes and parts from your novel and leave them out in the final version of the screenplay. This does not mean that the film will not be a good one, nor does it mean that the film will not be faithful to the original story from the novel. It just means that you need to put in the effort to tell the same story, with the same major characters, in fewer scenes and with fewer characters (especially the characters that do not reoccur in many scenes in the novel). The plot will need to move faster, the characters will need to show many aspects of themselves in just one scene (rather than the multiple ones you may have had in the novel). In the end, film is primarily an audio-visual medium of communicating the story, and like any other means of communication, it offers a different way of telling a story. Writing a screenplay adaptation of a novel means adapting that novel to that specific medium, and while you may have to do a lot of changes, that does not mean that you need to make major changes in theme, characterization, and plot.